Start by dicing your onion. I went with a pretty fine dice because I knew I was going to be making small egg rolls and there is no need for big pieces of onion. The green pepper is next. Same thing. Give it a fine dice. In a hot, large pan, with a drizzle of olive oil, sauté your vegetables until they are cooked but still crips. A bit of color adds a natural sweetness to the vegetables. Remove them to a paper towel lined plate and get ready to cook your frozen sliced steak. I use the same hot pan that I cooked the vegetables in. The flavors left over from the onions and peppers will mingle with the meat as it cooks. I add a dash of salt and pepper to the meat as it cooks. This is optional and you should flavor your meat to your taste. I use a flat metal spatula to break the meat up into bite sized pieces as it cooks. I let the meat cook until it is just about to lose the last bit of pink. Then I transfer it to a paper towel lined plate to drain off the excess fat. In a large bowl, combine your meat, cheese and cooked peppers and onions. This is the reason that you want the meat and veggies to cool. If they are not cool enough the cheese will start to melt. It is not the end of the world if the cheese melts but it will make for easier rolling if your cheese is not gooey! 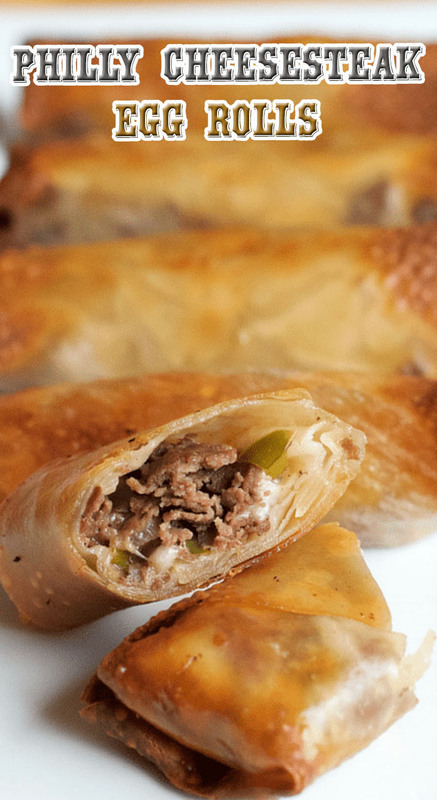 On a clean, dry surface it is time to roll up your Philly cheese steak egg rolls. I use about a 1/4 of a cup of filling in each one. For these egg rolls you are going to want to cook them in 2 stages for optimum crunchiness. Start at 350 for 10 minutes followed by 392 for 3 minutes.